A night of fitness like Fort Wayne has never seen before! The Fort Wayne Dance Collective and Open Streets are teaming up to bring you an open-air fitness concert in downtown Fort Wayne. DJ-spun music, calorie slaying moves, the country’s hottest cardio-funk class, the city’s best yoga instructors, a HIIT trainer and ONE HUNDRED people working out together under the stars. Your chance to get in on this ONE NIGHT ONLY event will be July 14th. The concert will be held in the heart of the city at the AEP Plaza located at One Summit Square on Calhoun and Wayne. As part of the event, concert goers will enjoy three killer fitness classes silent disco style, a swag bag valued at over $30, health and wellness vendors, and a live DJ will mix music the whole night. 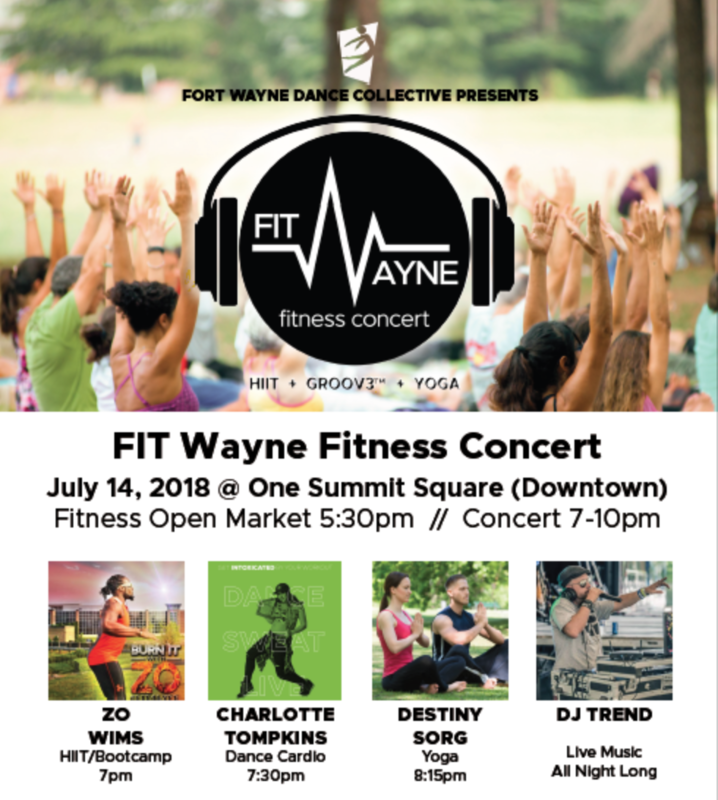 FIT Wayne will introduce new-age, unorthodox fitness options while engaging the local community to set a new benchmark for Fort Wayne’s health & fitness participation. We believe Fort Wayne is eager to get healthy, so we are going to give our community one sweaty night to improve their lives, promote positive changes, and meet like-minded people! Fort Wayne has never seen this type of event before. Are you ready to join the action? (Space is limited to 100 people.) Be sure to get your tickets HERE today! lululemon | Freshii | Health Food Shoppe | Vitamin Shop | Complete Nutrition and so many more!